Fashion editors have a knack for turning every single event into one fabulously stylized production, from spontaneously-hosted get-togethers in their casa to making a major fashion editorial out of their very own wedding. That said, you can definitely expect a fashion editor take on the season of pomp and partygoing—that is, Christmas—with a slew of unexpectedly fasyon outfit combinations that go well beyond your standard red/mettalic/tight holiday outfit expectations. With the help of our perennial fast fashion favorite, H&M, we took time to assemble three outfit combos from their Holiday collection. Run to your nearest H&M brand fast, for these pieces might just run out, or watch out as the second batch of their Holiday stash rolls into stores by December. Preview picks from the H&M Holiday Collection: Ruffled top, P1190; Camisole, P899; Leather pants, P1690. Every fashion editor's relative inability to layer in this scorching tropical country somehow gets quelled when Christmas season approaches. Cooler temperatures have us ransacking our closets for all the pieces we've wanted to layer: this year, we're digging the combination of soft, feminine pieces with biker chic elements, such as this camisole (P899) layered on top of a ruffled mustard sweater (P1190), finished off by tough girl leather pants (P1190). 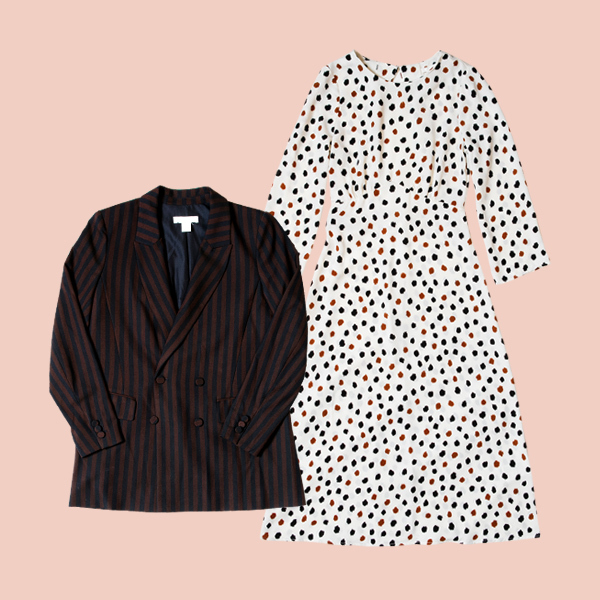 Preview picks from the H&M Holiday Collection: Pinstripe jacket, P2290 and print dress, P2290. If you only knew how editors decorate their Christmas trees, then you won't at all find it outrageous how they manage to pull off random pattern mixing for the holidays. For example, we'd take this printed maxi shift (P1190) and top it off with a more structured pinstripe blazer (P1490), which we like a bit oversized. Notice how both pieces feature similar shades of Autumn brown, which is the a classic pattern play hack every fashion editor swears by: pick contrasting prints with a common color, and see how they pair up seamlessly. Preview picks from the H&M Holiday Collection: Black dress, P899; T-Shirt, P899 and Sweater tee, P899. Shop the first round of H&M's Holiday Collection, in stores now, and watch out for the second batch of its Holiday pieces. Keep updated with hot H&M releases by reading their newsletter.